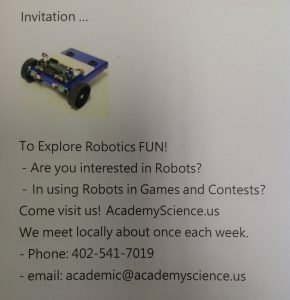 AcademyScience is pumped to run through its preparations for presenting STEM Science Technology Engineering Math at its NESciFest Nebraska Science Festival activities and events. Part of this year’s presentation plans are grounded in finding adequate space indoors to accommodate AcademyScience’s grand plans! If you are ready to roll, come with us to UNOmaha University of Nebraska at Omaha PKI Peter Kiewit Institute IST Information Science and Technology Open House! AcademyScience looks forward to visiting IST at PKI to see what new and interesting topics in CSE Computer Science and Engineering the faculty and students are working on now! 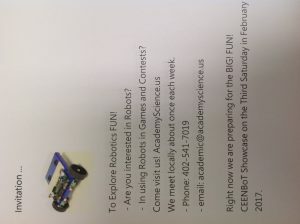 AcademyScience enjoys observing, supporting and participating in Robotics STEM Science Technology Engineering Mathematics! Our team can not wait to demonstrate to the community what we learn in preparing for competition! We look forward to meeting, greeting and exchanging ideas with you! If you are unable to visit us, let our leaders know and we may be able to visit you. Are You a LEGO® brainiac?! Do you enjoy all kinds of LEGO®s? Would you like to experience what it is like at a demonstration? Then contact us and plan to be there! Friday January 13th sometime between 3:00 – 7:00 pm. Lego Boost is going to turn all your Lego toys into programmable robots! This is a must demo list item for the imaginative Lego minded brainiac (uh, where do I find one of those?)! 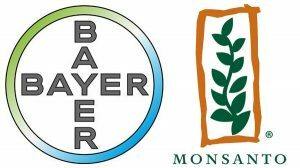 – can’t wait to try one out! AcademyScience explores all things science in the community and has FUN! Lego Boost is the idea that Lego was overdue to debut. 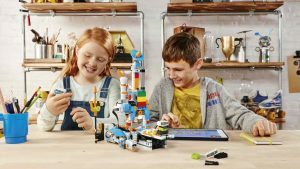 It’s a set of motors and programmable bricks that can work with existing Lego kits and turn them into motorized or motion-sensitive toys. And the app can record voice effects … so, yes, you can make your robot Lego-cat speak. 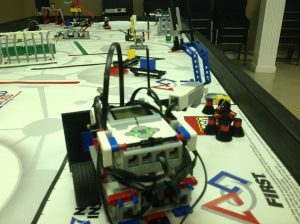 To Explore Robotics FUN! – Are you interested in Robots? – In using Robots in Games and Contests? We meet locally about once each week. Humans have incredibly tough schedules, with long work hours, not enough sleep, and the growing responsibilities of every day life. There are estimates that one in every four among us has some form of mental disorder – primarily stress, and depression. Not many take it as a sign of mental disorder, but prolonged stress and depression can have catastrophic effects on our well-being, and our mental abilities to stay focused and give proper attention to daily tasks. Some suggest one of the best remedies may be to get a pet dog or cat. Research shows that pets, especially cats and dogs, are an excellent mood enhancer. 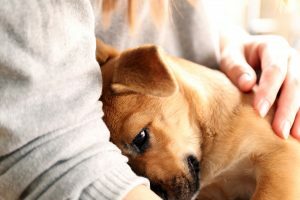 There are numerous ways to reduce stress but pets have great advantages over many others. Dogington Post, November 11, 2016. Interested in Exploring Science in the Community? We meet weekly and we have FUN! TOLEDO, Ohio. 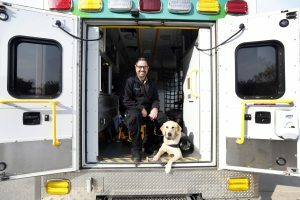 Louis Belluomini exited from a parked ambulance at ProMedica Flower Hospital in Sylvania as he held a leash and said “side.” Less than a second later, Star, his service dog, went into a sitting position next to him and lay down. It was when he and his wife moved in together that he decided to take action. Geoff Burns. Blade (Toledo, OH). November 6, 2016. picked up, republished by Military Times.